Anonymous, 29 Apr 2015I know now that each one of the 4 LG AKA has its own different name, color, character and pers... moreSorry, you can't, the personality is based on the color back case that you are using, you can only change to either one of the personality if you have the other 3 colors back case. For example, You can't get (Yoyo)Pink color's eye when you are using (Eggy)Yellow color back case. looks good, but comes in india? I know now that each one of the 4 LG AKA has its own different name, color, character and personality. But is it possible to have Eggy, Wooky, YoYo and Soul personalities (meaning the eye styles and themes) on one same device? I want to have this phone. 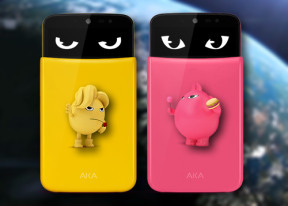 The phone would be better if they allowed the user to change the shape of eyes regardless of the character chosen. LG should have made the phone much cuter by making it have animal ears on top of the phone and some animal mouth on top of the lid surface to give it a real face. Too cute I want one. This would be a wonderful gift for my niece's. They should've partnered with McDonald's to make these the next line of Happy Meal toys. Collect all 4! I like the concept of this phone... Besides maybe this can be progressed to an always on virtual assistant.